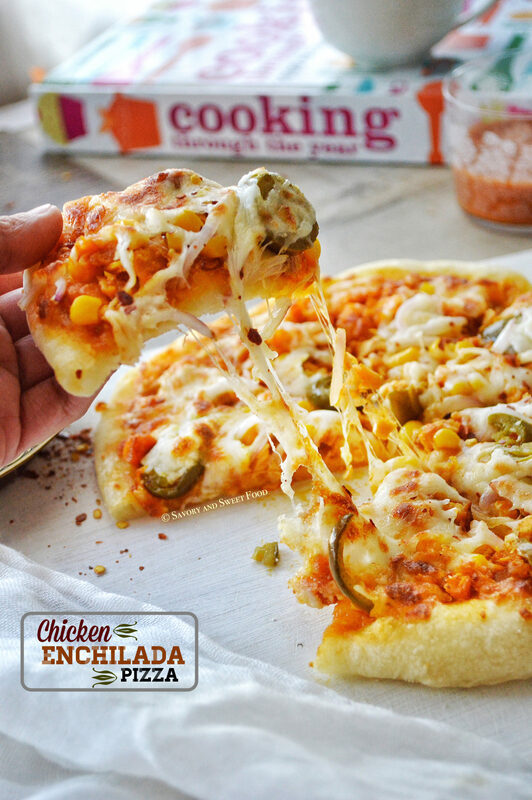 Soft, pan style no knead pizza crust topped with your favourite enchilada sauce, shredded chicken and more. 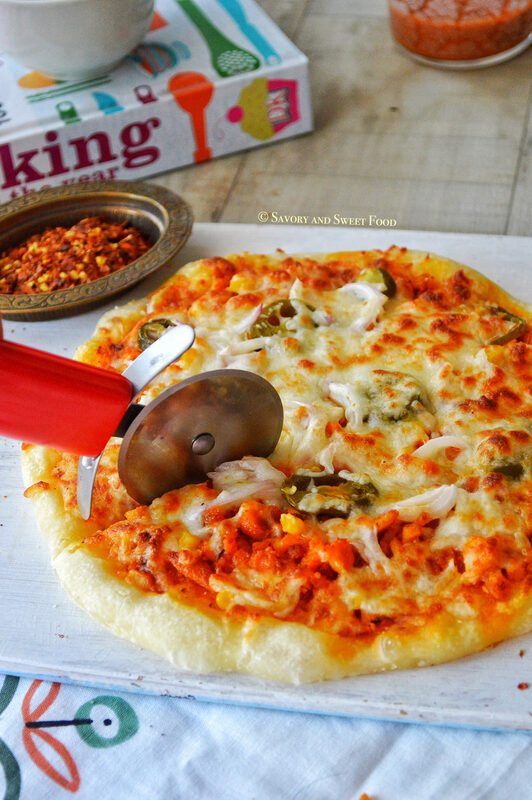 Pizza lovers, you will need to brace yourself for this one because this pizza is really gonna blow your mind :). Homemade spicy enchilada sauce, flavourful shredded chicken and all kinds of fixings, this is so good that you will have a hard time sharing it :). I simply love LOVE Mexican food. 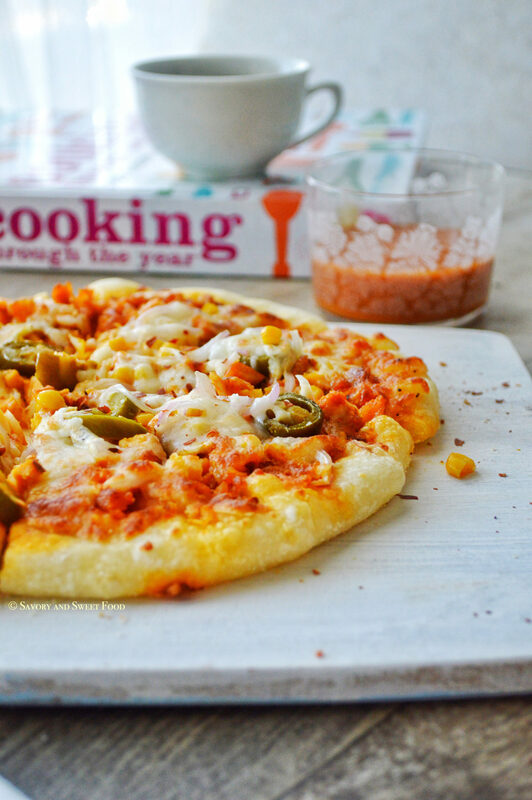 Its so spicy, love the flavours, love their sauces,the jalapeños….yumm…I’m drooling already. 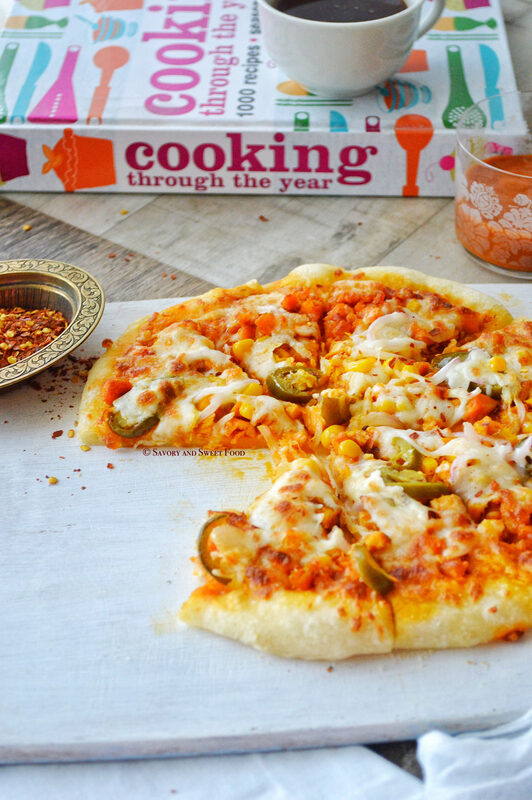 Nowadays traditional pizza served in Mexican style has become so popular. 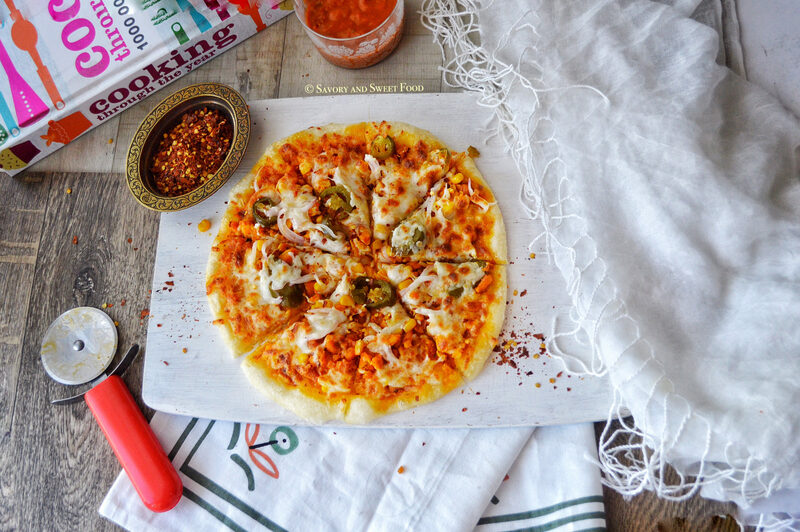 Aah I love Papa Johns Mexican flavoured pizza, if you haven’t tried this one, you are missing out on something really yummy. 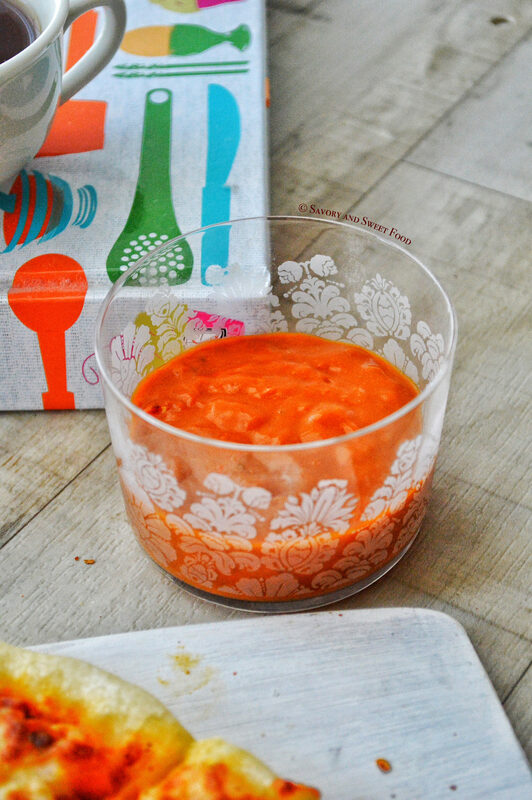 Here I have made homemade enchilada sauce, but you can definitely use the store bought ones. but I wouldn’t recommend that much as it is so easy to make this sauce at home and you don’t have to worry about those nasty preservatives. I made a great pizza crust this time. 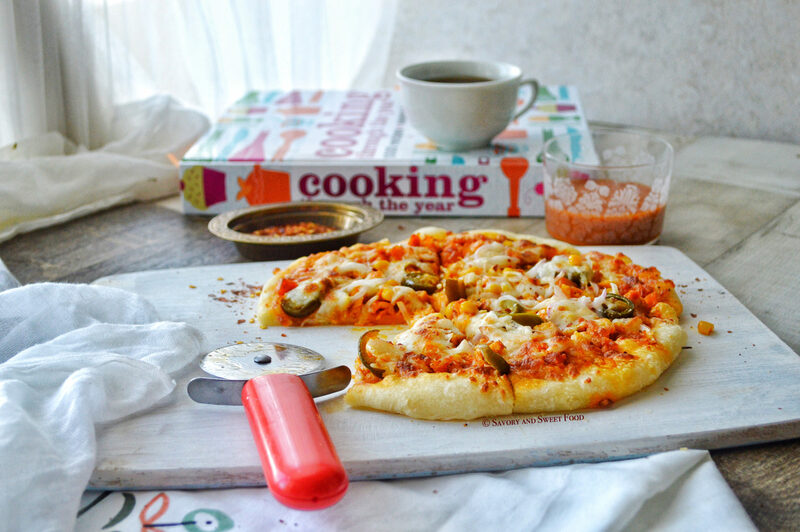 What I loved about it is that it is a NO-KNEAD pizza dough. And I followed my favourite chef Johns pizza crust recipe EXACT. 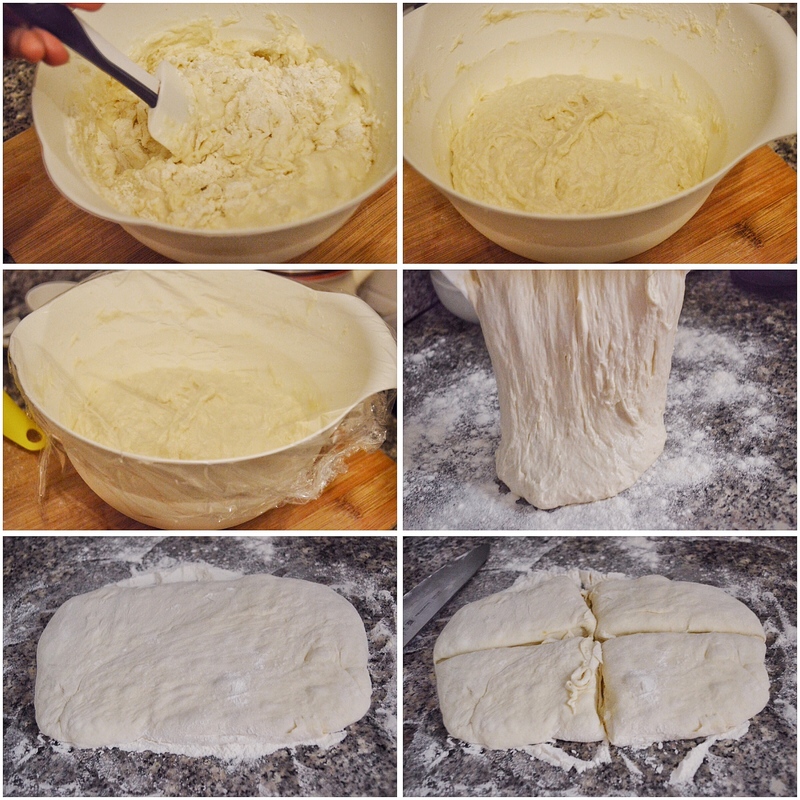 It came out flawless, you absolutely don’t have to knead it, just mix the ingredients with a spoon. But it will take at least 14 hours to develop enough gluten, and could take as long as 24 hours to double in size. Just make the dough one day before you plan to make the pizza. Check out Chef John’s No Knead Pizza Crust recipe. I marinated the chicken in a little red chilli powder, turmeric powder and salt and shallow fried it. You can use any leftover chicken too. Do not over bake the crust or it will get very tough. This dough will get cooked really soon. Mine took just 7 minutes. 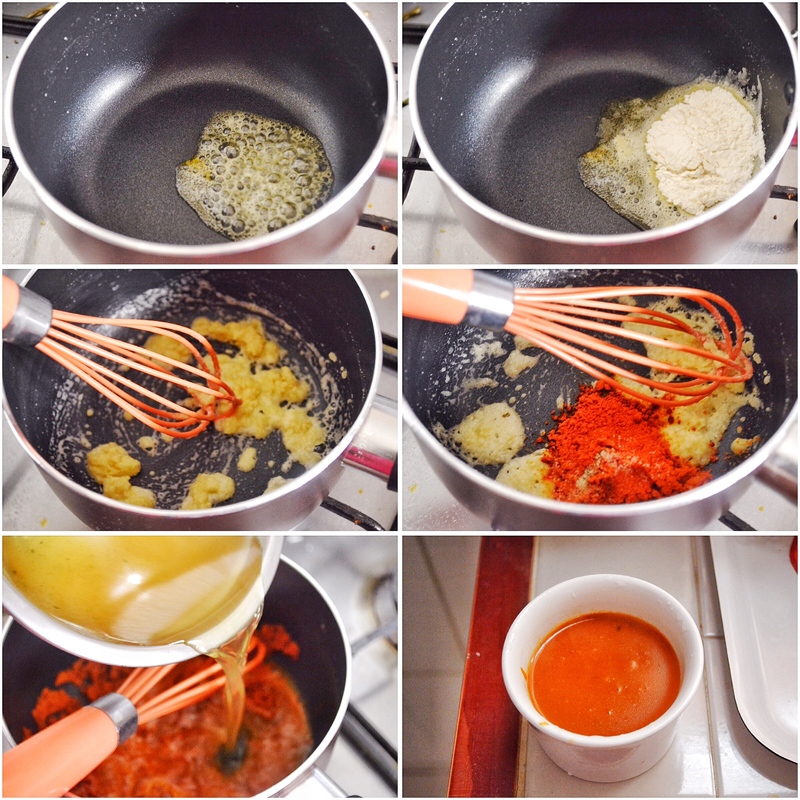 Adjust the amount of red chilli powder according to your preference. I used a mild red chilli powder. If you have spicy red chilli powder just add 1 tbsp of it. For the enchilada sauce, if you are using stock which has salt in it, be very careful while adding extra salt. Hop over to chef johns website where you will get the list of ingredients and a video tutorial. Heat oil in a saucepan. Add in flour and stir over medium heat for a minute. Stir in chilli powder, garlic powder, cumin, and oregano. Gradually pour in the stock, whisking constantly to remove any lumps. Reduce heat and let it simmer for 10-15 minutes till the sauce gets thick. 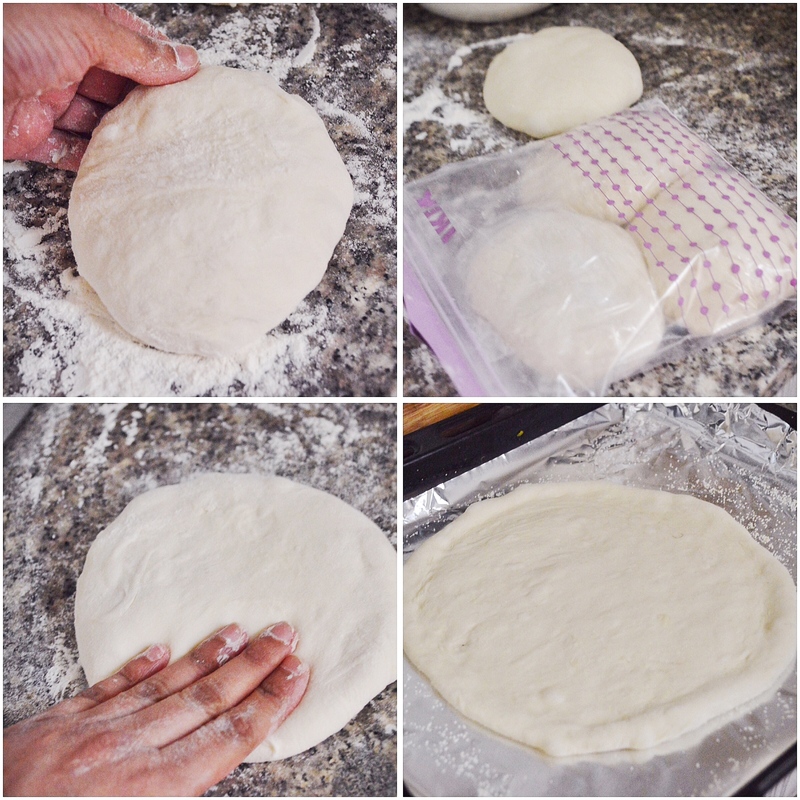 Shape the pizza dough into desired shape and size. Drizzle olive oil on top. 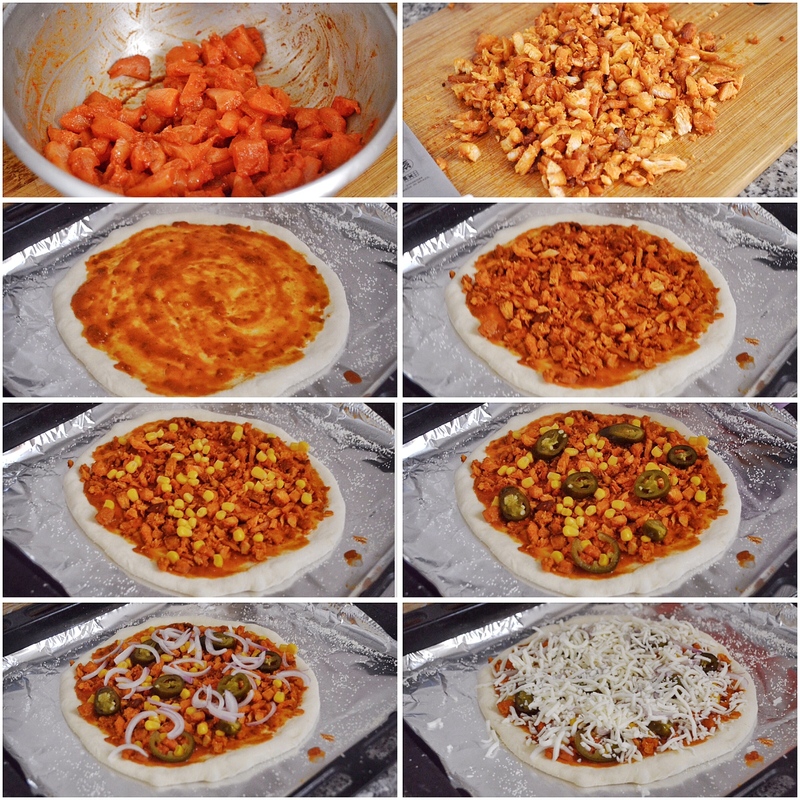 Spread enchilada sauce on the dough. Add in the chicken, corn, jalapeños, onions and finally cheese. Bake for 7-10 minutes on high heat till crust is done and cheese melted. Yes, you can make this in a pan. Cover and cook on very low flame till the crust is done and cheese melts. It won’t take much time as the crust is thin.